Congress CEO Stephanie Bell (left) resigned yesterday as claims were being made that Indigenous Health Minister Warren Snowdon (right), the Member for Lingiari, declined to fund another indigenous health service unless it operated under the control of Congress. Bess Price, who is now the Country Liberals candidate for the Territory seat of Stuart, says she acted as an interpreter about two years ago in a conversation between Mr Snowdon and Yuendumu resident Matthew Egan. Mr Egan was instrumental in setting up the Willowra Yuendumu Nirripi Health Service (WYN). She says Mr Snowdon told Mr Egan that Federal funding would be approved for WYN only if it submitted to the control of Congress. Mr Egan declined, says Ms Price. The organisation has since been closed down because lack of funding, according to a long time Yuendumu resident who did not wish to be named. As reported by the Alice Springs News, a Federal investigation is now under way into a string of alleged wrongdoings by Congress. In part, it is alleged that Congress improperly diverted into a special fund 20% from grants and paid it into a special fund, as a fee for administration. A letter to Congress from the Department of Health and Ageing, leaked to the Alice Springs News, says “a major concern [is] that the amounts deducted from the grants … are allocated to a Core Services budget [which] makes it difficult to identify how these funds are used”. For example, “interest earned on Funds for other purposes is a breach of the funding agreement”. The letter from the department says that Congress may have to repay up to $2m in funds used improperly, including air fares and unauthorised use of Ms Bell’s corporate credit card. In June 2009 Mr Snowdon became the Minister for Indigenous Health, Rural and Regional Health and Regional Service Delivery. He did not respond to a request for comment from the Alice Springs News. The many still unanswered questions in the Federal investigation notwithstanding, the statement by Congress announcing Ms Bell’s resignation is effusive in its praise of her work. It quotes Congress board president Helen Kantawara: “On behalf of the Board, I would like to thank Stephanie for her hard work and contribution to Congress throughout almost 30 years of service – the last 11 of which were in the role of CEO. 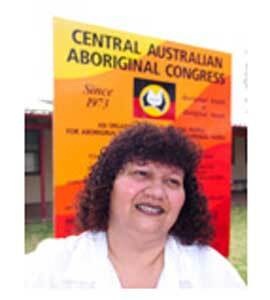 Ms Bell’s continuous period of service to the Aboriginal community throughout this time is acknowledged as an important and unique contribution to primary health care in a remote area, the statement says. “Ms Bell was the 2011 recipient of the Menzies Medallion, in recognition of her outstanding contribution to primary health care and to Indigenous health in the Northern Territory. The Menzies Medallion is awarded annually by the Menzies School of Health Research to honour individuals who have made a national contribution to health, in areas which have benefited the Northern Territory,” says Ms Kantawara. As reported by the News, the board has appointed Ms Donna Ah Chee to the position of Acting CEO. Minister Snowdon was quite correct in directing that WYN Health Service operates under the auspices of Congress which is a Federal and Territory accredited organisation created to deliver a range of services to remote communities. To streamline administration typically governments tend to prefer to deal with established peak bodies rather than smaller organisations. It remains to be seen how efficiently Congress has acquitted its grants, but to implicate the Minister is really an unnecessary inclusion. CAAC’s scope is to offer an alternative primary health care to the indigenous sector of the Central Australia population. Keep it at that. Additional peripheral activities and therefore additional revenues have generated the intricacies of political pursuit of local power to the detriment of Congress’s core objective. I would suggest to simply go back to the roots and forget the frills.